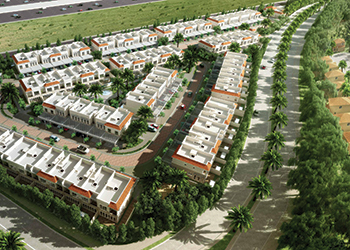 Jumeirah Golf Estates (JGE) has signed up Progress Constructions as the main contractor for the townhouses and retail centre within its mid-market residential community, Alandalus, in Dubai, UAE. A Mediterranean-inspired collection of affordable luxury apartments and townhouses, Alandalus is set on a 375-hectare area, 75 per cent of which is made up of lush green landscaping, with lakes and nature strips throughout. The townhouses comprise 95 two- and three-bedroom homes inspired by Andalusian architecture. The retail centre sits at the heart of the Alandalus community, which also features 715 apartments, Jumeirah Golf Estates’ second clubhouse, and a hotel, altogether offering residents a variety of wellness, leisure and entertainment options. Residential properties take up the remainder of the development, and considering that three-quarters of homes enjoy views of the golf courses, residents are promised an exceptional outdoor lifestyle experience. The awarding of the contract brings Alandalus a step closer to completion, and means the townhouses, located just minutes away from the site of Expo 2020, are on track for their handover commencing in September 2018. Jumeirah Golf Estates CEO Yousuf Kazim says: “We launched the development targeting a niche segment in the Dubai market that we believe has yet to be catered to, offering luxury living choices with affordable prices. The townhouses combine modern and traditional Andalusian materials with functional, sophisticated, comfortable indoor and outdoor spaces,” he notes. JGE has made remarkable progress in construction of Alandalus thus far, he says. “Considering the strong track record of Progress Constructions, we are confident that we will be equally effective in our delivery of the townhouses and retail centre for our investors,” he adds.